Ninja chopped Romaine layered with avocado, local bacon, juicy grape tomatoes, egg, and tasty Blue Cheese. Toss it with our Herby Green dressing and call it a day. The best kale salad you’ll ever eat in your life. Kale. Cranberry. Mango. Almond. Badabing. Badaboom. gettin’ down with our Turmeric Tahini dressing. Get ready to SHINE! Lavender + Honey + Chicken. Celery + Grapes + Pecans. (Paleo) Korean glass noodles, fresh herbs and a peanut dressing that would make Grandma proud. 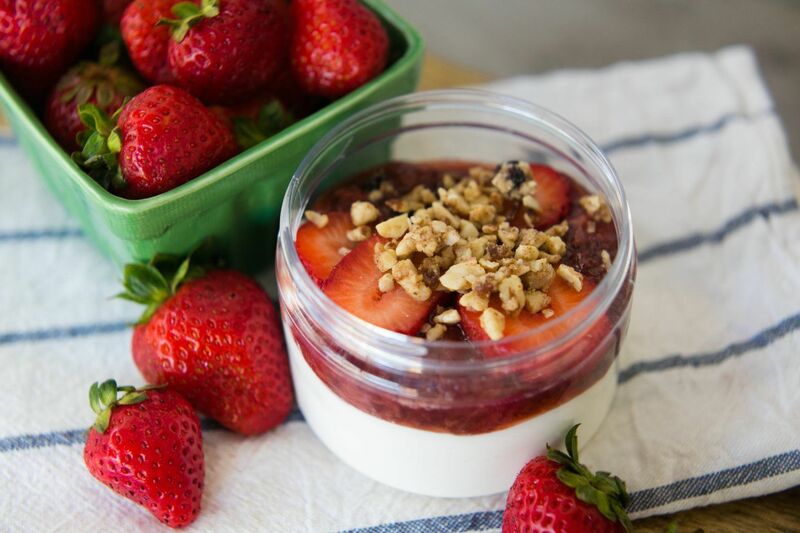 Greek Yogurt, honey, vanilla and a balsamic strawberry compote. Topped with a Paleo Granola, just because. Organic oats creamed with coconut and almond milks. Topped with a balsamic strawberry compote and Paelo Granola Crunch. Or maybe we should call it Pop Art? A childhood fave filled with maple whipped peanut butter. Schmeared with creamy icing. Coco. Avocado. Orange zest. Whipped and whipped and whipped. So Paleo it’s good. Nuff Said. Our family’s fave French Comte. Just trust us. Quinoa, Nuts, Cranberries, Oats, Yum. Nuts, Shredded Coconut, Spices, Maple. It’s the stuff dreams are made of. Lime infused sparkling water that’ll make ya go “WOW”. Sparkling water that’ll make ya go “WOW”. A can of kombucha. Sparkly goodness that will make your gut shout - WHOOT WHOOT!